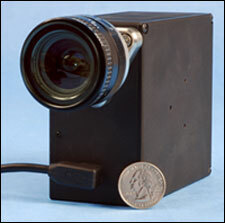 Bodkin Design & Engineering LLC has launched the VNIR-90 snapshot hyperspectral imager. Developed during five years of military research, the company is now offering its patented HyperPixel Array technology to the commercial market. The imager has an optical processor that captures the full hyperspectral data cube in each video frame. Unlike conventional slit-scan hyperspectral imagers that take seconds to build up the data cube, the device captures the full data cube instantly. The system can be mounted on moving platforms, or used as a handheld device for capturing transient events or moving objects. Covering the spectral range from 500 to 910 nm, it produces a data cube of 55 × 44 spatial pixels × 90 spectral bins. Average spectral resolution is 4.56 nm/bin. Interchangeable C-mount lenses enable variable fields of view. The system is supplied with a USB interface, a laptop PC, and loaded capture software to produce environment for visualizing images (ENVI)-compatible data cubes. Originally designed for foliage detection, the VNIR-90 has also been used to characterize skin lesions, to detect bullets in flight, and to develop products for the cosmetics industry.